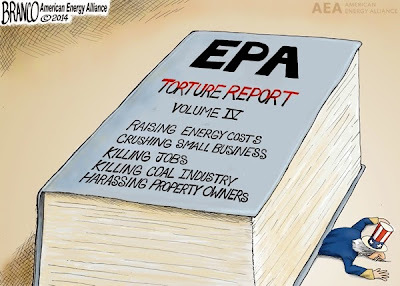 Warning Signs: The EPA Myth of "Clean Power"
These direct quotes from the Declaration of Independence need no further explanation. • He has refused his assent to laws, the most wholesome and necessary for the public good (energy and monetary policy to destroy our economy and enrich his cronies and our enemies.). • He has forbidden his governors to pass laws of immediate and pressing importance (illegal immigration, maintaining the peace), unless suspended in their operation till his assent should be obtained; and when so suspended, he has utterly neglected to attend to them. • He has dissolved representative houses repeatedly (bypassing Congress by Executive Orders, overturning initiatives voted overwhelmingly by the people – immigration policy, marriage under natural law between a man and woman. ), for opposing with ‘manly’ firmness his invasions on the rights of the people. • He has refused for a long time, after such dissolutions, to cause others to be elected; whereby the legislative powers, incapable of annihilation, have returned to the people at large for their exercise; the state remaining in the meantime exposed to all the dangers of invasion from without, and convulsions within (Occupy anarchism, union thuggery, failure to enforce the borders, establishing a ‘civilian defense force as strong and well-funded as the military’)..
• He has endeavored to prevent the population of these states; for that purpose obstructing the laws for naturalization of foreigners; refusing to pass others to encourage their migration hither, and raising the conditions of new appropriations of lands (Removing lands from resource exploration and development, draconian EPA and development regulations, minimum and prevailing wage demands to eliminate competition and compromise free enterprise). • He has obstructed the administration of justice, by refusing his assent to laws for establishing judiciary powers (Appointing judges who have disdain for the Constitution, even though they solemnly swear to uphold it – in league with all too many elected and bureaucratic officials.). • He has erected a multitude of new offices, and sent hither swarms of officers to harass our people, and eat out their substance (Obamacare with its 159 new agencies and selective privileges in green, health, education, welfare and union venues). By applying Alinsky’s Rules for Radicals and Cloward and Pivens strategies, the Administration and its cronies are overwhelming the system with harassment, untenable regulations, creating dependency by a large segment of the population through ignorance of our laws, traditions and history and usurping the parental role and responsibility for raising children in favor of the state. Thanks Dan There are three sites - actually many more where the truth is being exposed over the lies of the "progressives" and internationalists. It's all about a one world government - not a global economy. They never learn. Wonderful comments Dan Pangburn and wildvortex.Would you two mind if I copied this and emailed it around. I'll leave off names and handles. Nec - emailing it around is fine with me; with or without names. Go for it. We have a nation to save. I thought I just said yes, but don't see it here. So, I agree with Dan. Thank you Dan and wildvortex. I don't use my name here on Blogger and like it that way. I email Mr. Caruba every now and then if I really like something he posts. I spend most of my time on G+ and sometimes link his posts on that service. Not sure if the comments can be linked but no matter.